How my Israeli kids are helping me stay focused during the current security situation. Chana Jenny . . . such a helpful message today. Thank you. I also use visualization to calm my nerves. This is what I do . . . I take the first four verses of Psalm 91 – and visualize that I am in the secret place – abiding under the shadow of Hashem. I keep doves at my place and hold them in my hands and I know how dear their wings are. When afraid, I visualize I have taken refuge under the wings of Hashem – and then I am flooded with peace – and can then carry on. Fear is debilitating – but peace brings liberty. 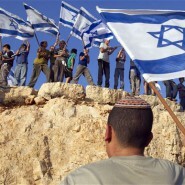 May all in eretz Israel be safe and abide in trusting assurance and peace. Very helpful pep talk! Thank you. It is so important to be calm and not to let the very real anxiety we all feel overwhelm us. very inspirational. thank you!! Good lessons to live by… happy belated Chanukah.